They should have just torched it… Start over. 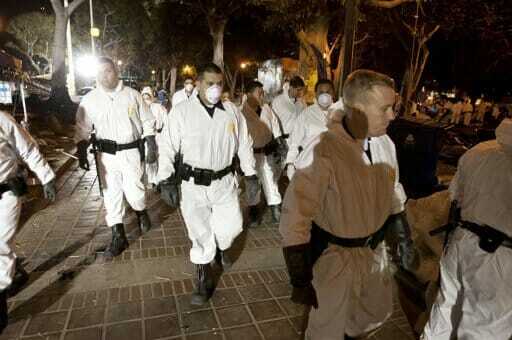 Police were forced to wear Hazmat suits to clean up after the filthy leftists. Trash, flattened tents and the stench of urine were the legacy of Occupy Los Angeles on Wednesday after hundreds of protesters were arrested or chased out of their City Hall park encampment. City crews erected chain link fence and concrete barricades around the park at dawn, six hours after 1,400 police officers swarmed the area. Later in the morning, police officers in white hazardous materials suits prowled the park in search of personal belongings to store for retrieval by protesters. “A lot of this stuff is contaminated with urine and feces and who knows what,” Cmdr. Andrew Smith said. 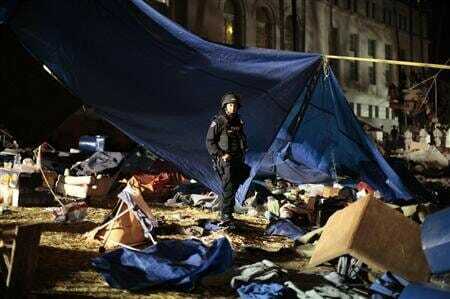 The LAPD and masked sanitation workers hauled away 25 tons of debris from the lawns around Los Angeles City Hall after police raided the protesters’ camp in the middle of the night.